This is a repeat message of last year. Same message from Babaji for doing hawan during the Diwali period, invoking Mother Mahalaxmi for abundance and prosperity. WISHING YOU ALL A VERY HAPPY AND BLESSED DIWALI! This is to inform all the Sadhaks that Babaji's message for Diwali is to do Sri Vidya Sadhana 2 times for 5days starting from Dhanteras (read more on Dhanteras below. The main Pooja you can do these 5 days is the Mahameru Kumkum Abhishek as given in below post. Babaji said that it is a most powerful pooja which is to be performed with all the family members together. Perform Kumkum Abhishek with the Mahalaxmi Mantra as much times as u can. 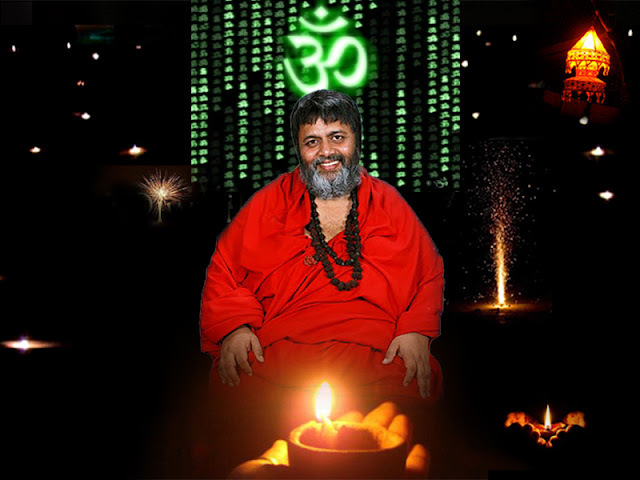 Also babaji told that do Havan in your home with the same Mahalaxmi Mantra and offer Havan Samigri of Wheat and Ghee mix together, this is for Prosperity and Abundance. Only Ghee will also do. Give this 21 or Any number of Ahuthis in Havan with a feeling of Happiness and Gratitude towards Mother Mahalaxmi. This is the Divine Message by: Param Pujya Avadhoot Baba Shivanandji. Bless You All...!!!! 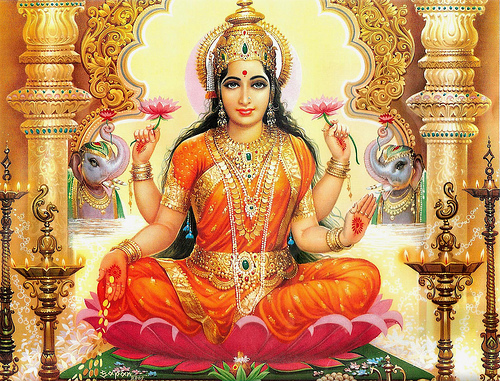 Thou has always the mystic symbols as Thy form, O Mahalakshmi obeisance to Thee. When is Dhanteras 2011 – Well the (धनतेरस, ધન તેરસ) Dhanteras 2011 Date is Monday 24th of October. There is a bit of confusion over the dates this year. Dhanteras 2011 is also celebrated on 25th of October at some places. Do check out from the people in your community as to when they are celebrating this festival. Dhanteras is the beginning or the first day of 5-day Diwali celebrations. It is also called as Dhantroyodasi as the day is 13th lunar day of dark fortnight(Krishna paksha) of Ashwin month. On this day, some people worship Dhanvantri while some begin the auspicious celebrations of Diwali. Dhanteras is made out of 2 words i.e Dhan and Teras. Dhan means wealth and on this day people worship Goddess Laxmi who brings peace, well being and prosperity to people. The 2nd part Teras means 13 as this is celebrated on the 13th lunar day of Krishna paksha in the month of Ashwin according to Hindu calendar. On the day of Dhanteras, houses, stores and business premises are cleaned, renovated and decorated. The entrances to the houses are made colorful with nice rangolies. Interior designing manifests itself on the occasion of Dhanteras. The walls are decorated with designs and on ceilings one can see decorations with laces and balloons. To indicate the arrival of Goddess Lakshmi small footprints are drawn with colorful powders all over the house floor. Once upon a time there was a king by name Hima. He was just sixteen years old and his horoscope said that he will die on the fourth day of his marriage by a snake-bite. His good wife was very scared by knowing this, after all this was a test of her devotion to her husband. She got a plan not to allow Yama, the death god, come near her husband. The young wife of Hima laid all her jewelery into heaps on the entrance of the room and lighted many diyas all over the place. When Yamadutas came to take Hima, they could not enter into that dazzling light. Again Lord Yama came himself at the spot and by that time she started telling stories and singing songs. Lord yama could climb the heap but by hearing the stories, he soon fell asleep. When it was morning it was the time to go. Yama had to leave the place. In this way she could save her husband’s life. Dhanteras is celebrated with great enthusiasm. People observe various rituals on this day. They lit Yamadeepam and hear the legends connected to Dhanteras. In villages cattle are worshiped by the farmers. People go for shopping for Diwali on the day of Dhanteras. Wishing all readers a very Happy Dhanteras!